YOUNGSTOWN, Ohio: Nearly 50 people stood in silence on the evening of Sept. 14, carrying flickering, battery-powered candles. They allowed one another a turn to speak their minds. 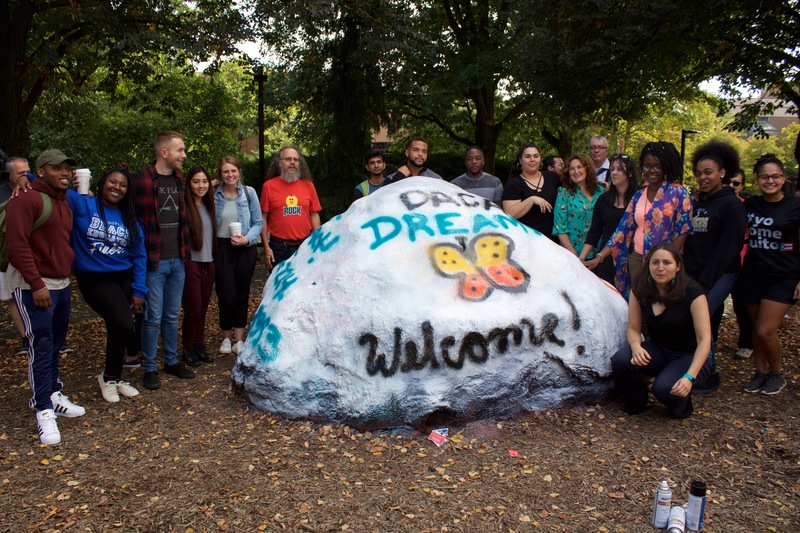 The group formed a circle around the rock outside of Kilcawley Center on Youngstown State University’s campus, which was painted with messages of hope and support. 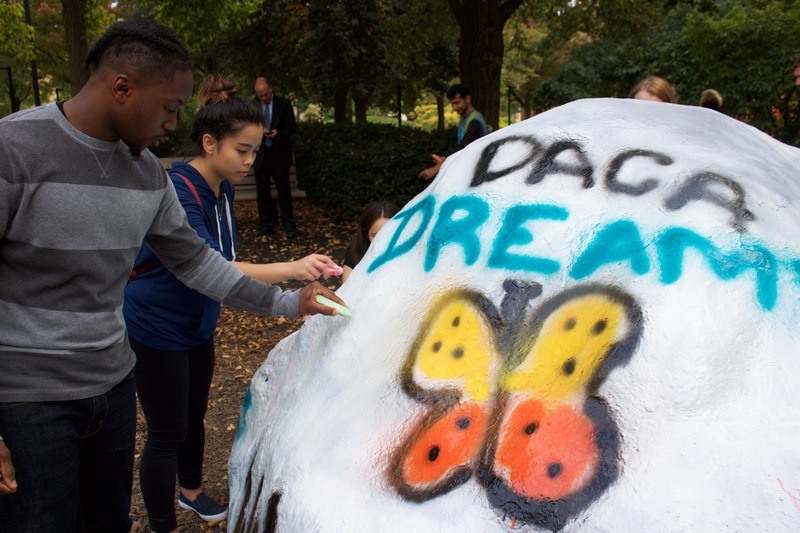 The peace-driven vigil was held to mark the opening of Hispanic Heritage Month and brought community members and attendees from the university together to show their support for those impacted by the rescission of the Deferred Action for Childhood Arrivals (DACA) program. Photo by Jordan Unger. Students, faculty and community members gathered for a vigil outside of Kilcawley Center. DACA, which was implemented under the Obama Administration in June, 2012, allowed immigrants who were brought to the United States illegally as children by their parents or guardians the opportunity to receive renewable deferred action against deportation. The Trump Administration announced the rescinding of DACA Sept. 5, declaring that the Department of Homeland Security would stop accepting new applications for the program. All renewals will be rejected as of Oct. 5, 2017. The rescission gives U. S. Congress a six-month window to determine a replacement policy for DACA. As stated in an article by National Public Radio, nearly 800,000 DACA recipients (informally called Dreamers) are left uncertain of their future, whether it be protection from deportation or returning to the country where they were born. Protesters against this policy change spoke out strongly at the YSU vigil. Ana Torres, co-advisor of the YSU Latino Student Organization and interim director of Maag Library, said she was moved by the community response. unfortunately, there are a lot of misconceptions and stereotypes regarding immigration, especially to the DACA students [on campus],” Torres said. There are currently very few DACA students on campus. Nate Myers, associate provost of the YSU International Programs Office, said when DACA students come to the university, their status is marked on file and they’re handled through the department, even though they are not technically international students. This can create some issues with the identity of these individuals, Myers said. Alicia Prieto Langarica, math professor at YSU, said she’s known and advised several DACA students at the university. Many of the Dreamers have no ties to the country where they were born, coming to the United States at a young age. Prieto Langarica said this will be a problem if they are sent back to these places. “They are all super achieving, hard-working students and it’s heartbreaking to think [they could be deported],” Prieto Langarica said. Prieto Langarica came to the country as an immigrant herself when she was 22, and she finished her higher education in Texas before starting to work for YSU five years ago. She received permanent residency after living in the United States for 11 years. According to the United States Citizenship and Immigration Services, permanent residency makes an individual eligible to live in the United States and legally able to work after filing for and receiving Employment Eligibility Verification. Permanent residents can also apply for a social security card and driver’s license. “I know that I cannot vote, I’m not a citizen of this country, yet I’ve been paying taxes for many years,” Prieto Langarica said. footsteps as her, particularly because not enough people in the country study mathematics, Prieto Langarica said. “Many of my DACA students want to be professors,” she said. Prieto Langarcia said these people pay taxes, are highly educated and are fulfilling a need the country has, so she doesn’t understand the need to kick them out. A common complaint Torres hears from people is Dreamers are taking jobs and resources from citizens in the area. She does not believe this to be the case. “They add to that competitiveness that is also healthy for any country, so my wish is for all of us to read a little bit more in-depth about it rather than just believing everything that comes across, for instance, our social media,” Torres said. Myers said immigrants have generally had a positive impact on the Youngstown, which has been a great, welcoming area for immigrants in return. He said immigrants have brought different skill sets and talents to the country, making it stronger. Prieto Langarica said it should be noted the parents of Dreamers are also fulfilling a need by working. everyone else should leave,’ because that’s not a solution,” Prieto Langarica said. Mark Monroe, chairman of the Mahoning County Republican Party, said he was impressed with Trump’s decision because this was a policy to be remodeled. authority to do what he did,” Monroe said. Monroe thinks there’s a widespread recognition that what Obama did was illegal and unconstitutional. He said Trump provided a six-month window for it to unwind and thinks the strategy was to put pressure on Congress to fix it properly. Monroe said Trump made it clear he had sympathy for individuals caught up the situation. “There’s some folks who think that because of Trump’s decision, folks are going to get arrested and thrown out of the country immediately, it’s going to be a terrible thing, but of course that’s not the case,” Monroe said. Mayor of Youngstown, John McNally, addressed DACA Dreamers during the heritage month opening festivities at the Mahoning County Courthouse, stating the city is working to stand by them and protect them. McNally said Youngstown isn’t proclaimed to be a sanctuary city, but it is very welcoming and wants people to want to live there. “They’re in our colleges, they’re our employees, they’re serving in the armed forces, they’re in our high schools,” McNally said. McNally said he understands a lot of concerns with border security and what we should do to prevent lapses in border security, but for those folks who have been here for any number of years, making positive contributions… there has to be a solution found for them. Monroe said he is unsure what the new legislation will look like, but it needs to accommodate DACA Dreamers effectively. “Hopefully it’ll be compassionate, it’ll be fair and it’ll be lawful,” Monroe said. Whatever decision members of Congress make in deciding a new policy, Torres hopes these individuals will be protected. “At the end of the day, this country was made by immigrants and I think that’s what makes it so unique,” Torres said. Torres said she has hope and faith this is just a bump in the road and it will be okay for these individuals.